Bryson's address is unrecorded but a set stamped 'G. BRYSON' is similar to chairs illustrated in M. Jourdain, Regency Furniture 1795-1830, rev. ed., 1965, figs. 90 & 94 (C. Gilbert & G. Beard, eds., The Dictionary of English Furniture Makers 1660-1840, Leeds, 1986, p. 123). 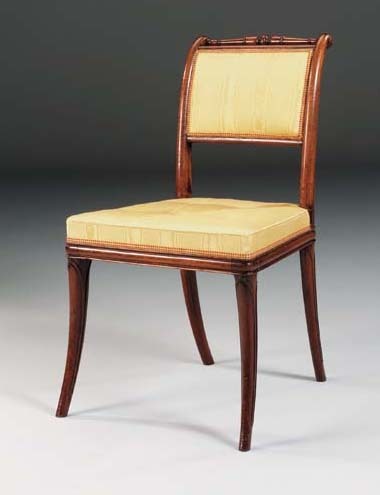 The elegant profile of the present chairs, with their leaf-wrapped legs and reeded frames relate to chairs of this design which were popularised by the connoisseur collector Thomas Hope's Duchess Street mansion museum which he illustrated in his influential publication Household Furniture and Interior Decoration, London, 1807. A related chair is shown on the left of plate II, the Picture Gallery. An almost identical set of four, executed in maple but unstamped, was sold anonymously, Sotheby's London, 16 April 1999, lot 194.